I am Lucia Raggetti, I am Assistant Professor for the history of Ancient Sciences in the University of Bologna. 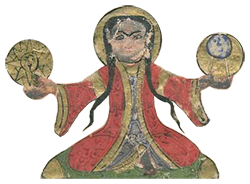 I am part of the ERC Project AlchemEast, Alchemy in the Making: From ancient Babylonia via Graeco-Roman Egypt into the Byzantine, Syriac and Arabic traditions (1500 BCE -1000 AD). This is a space to share my professional interest in Mediaeval scientific literature in Arabic, and its manuscript tradition.